Hello, Happy New Year and thanks for visiting. I had intended to write up a short summary at the end of the year but never quite seemed to have the time the past couple of weeks. 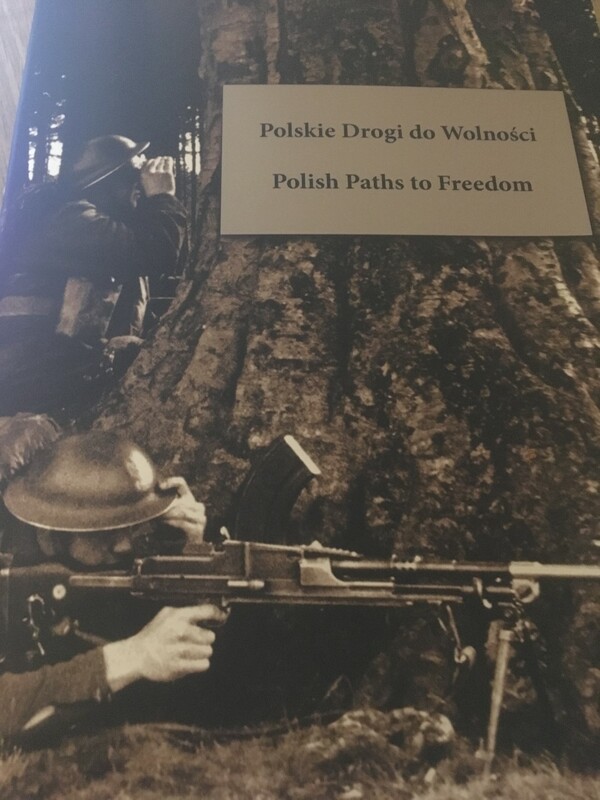 Here we are then, a new year; welcome 2018. I hope everyone had a wonderful and (dare I say it) relaxing holiday period, Christmas though seems like a long time ago. 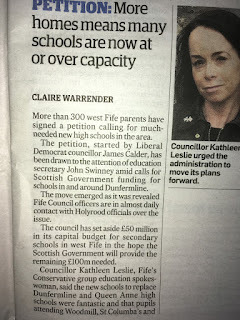 Today was "officially" my first day back after the break, although I did receive some correspondence and kept an eye on what was going on - 2 issues dominated - cancelled trains on the Fife Circle and the very unpleasant "surprise" for many pupils in West Fife when they were advised a week before Christmas that they were being added to a "lottery" in regards to where they would go to high school. Given the background to the capacity crisis in Dunfermline due to extensive house-building, poor planning by Fife Council and a panicked rush by Council officers to have Councillors do their bidding and sign up to a poorly thought out catchment rezoning plan (which we decided to reject) it should have come as no surprise that the situation would be "handled" right before the holidays. 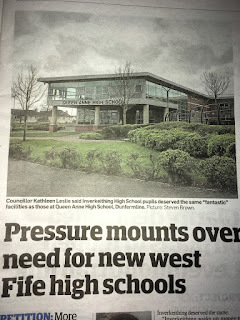 Resulting in parents in the busy pre-Christmas period attempting to seek advice, reassurance and assistance at a time that Council offices were winding down and being too late for Councillors to voice their concerns both to the Education Directorate and publicly to the media. 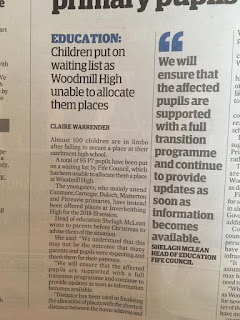 What was to potentially be a school that would be 50 pupils over capacity suddenly shot up to 95 pupils with a number of primary schools in the Woodmill catchment area receiving this in with their Christmas cards. 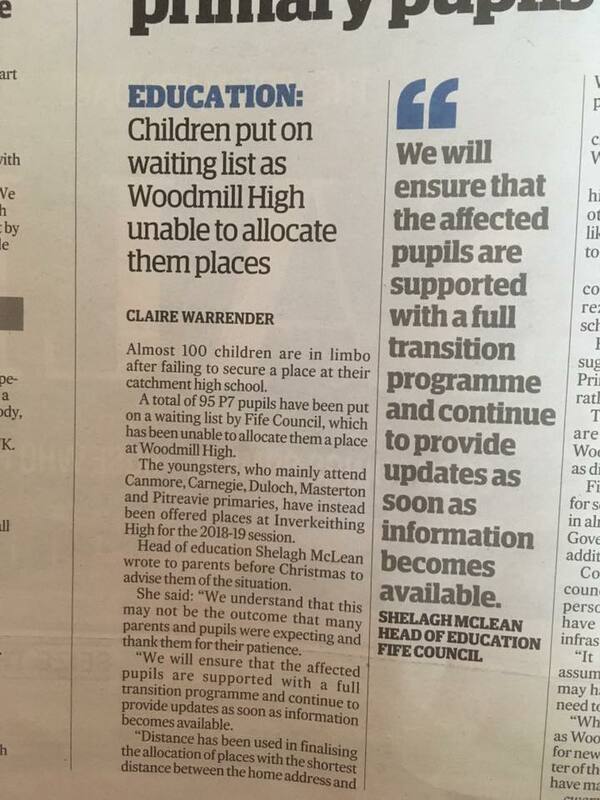 This pupil "lottery" will see some primary seven children taken away from their peer group and placed at a different high school. Placing requests are of course possible, but again that will mean children being separated. 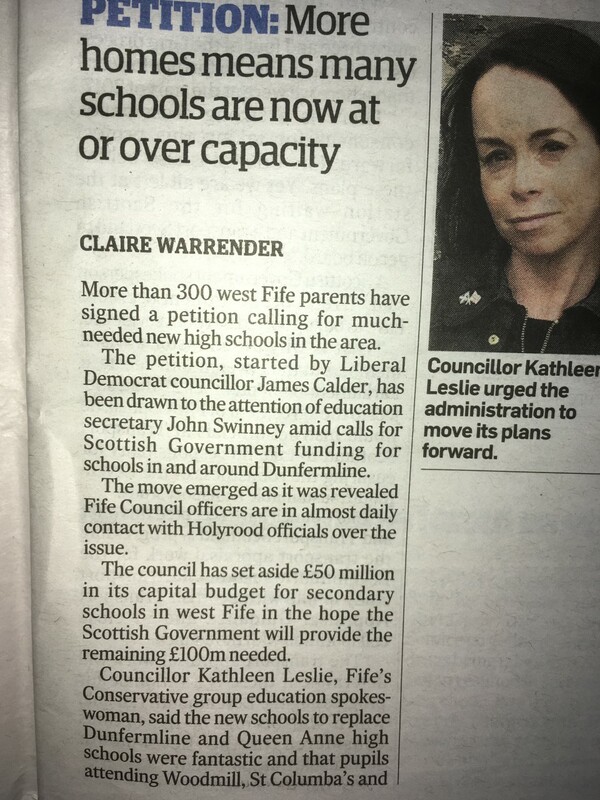 All of this after months of uncertainty and Councillors rejecting the rushed plans. It seems what we rejected, officers have just gone ahead with. Additionally, you can make a placing request - that is your right. 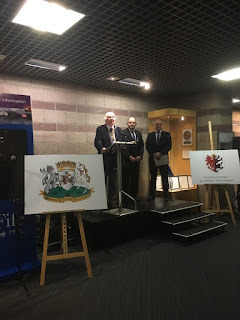 Contact your locally elected councillor and/or MSP for advice. 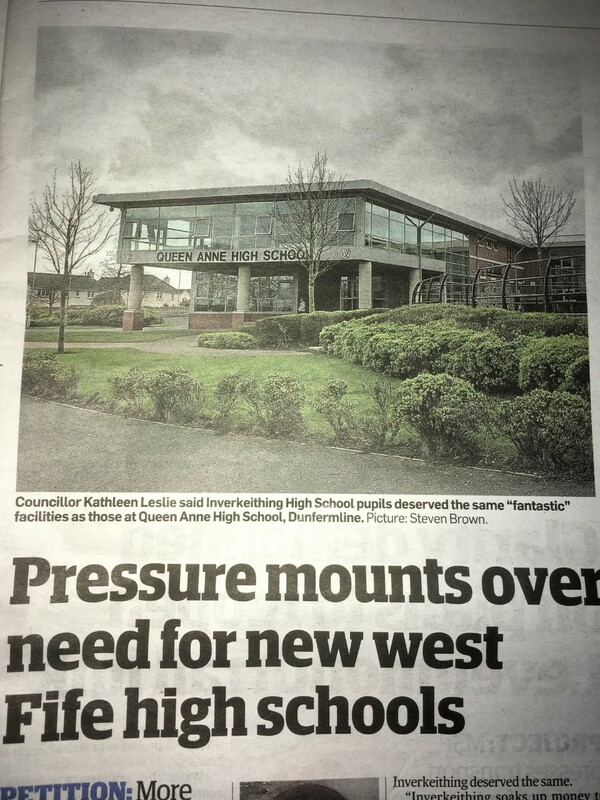 As many of you will remember, in December I brought a motion to Full Council requesting that plans for new high schools in Dunfermline and West Fife were moved forward and that regular (quarterly) reports were presented. 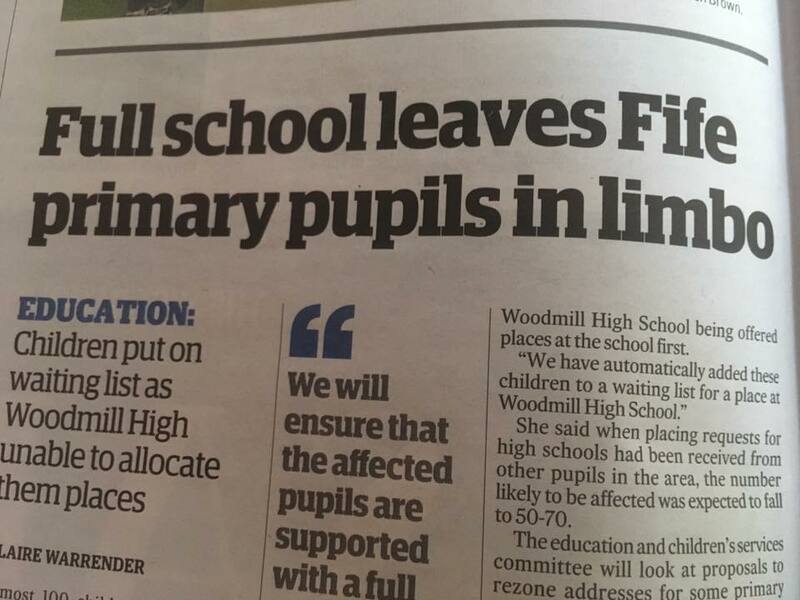 This of course was rejected by the SNP-Labour Administration. 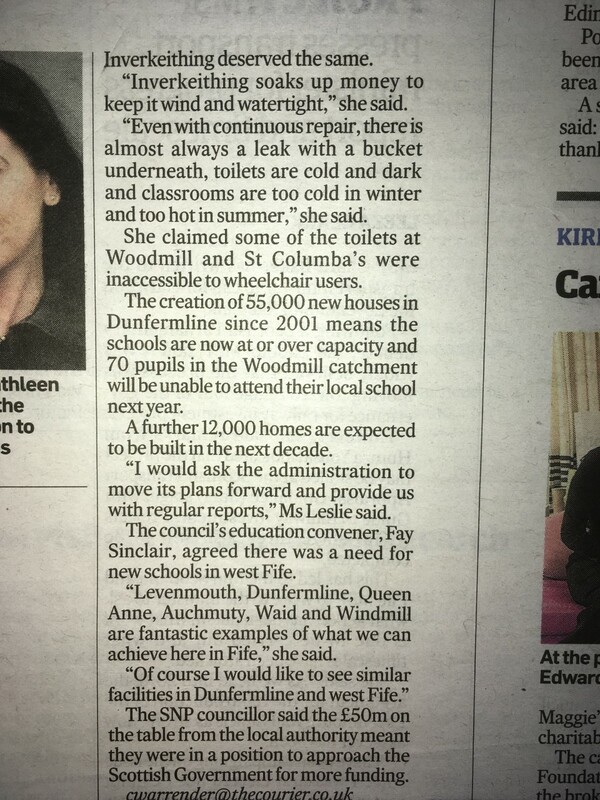 Some further coverage of it was written up in last Saturday's paper. 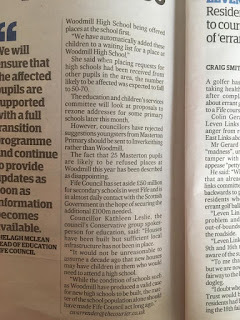 This issue must continue to be pushed at the Council. It appears talks are ongoing but we need to see some action now. 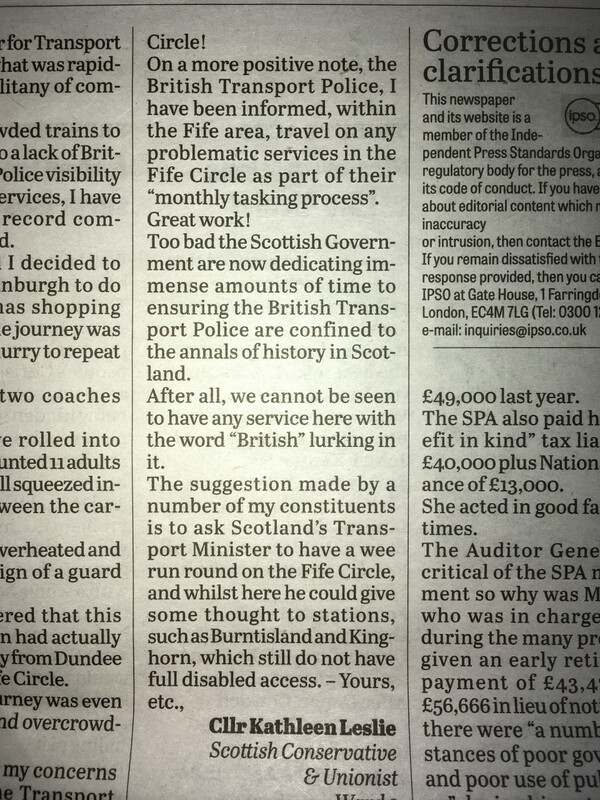 Trains - Cancellations/Overcrowding - Are Passengers Getting A Fair Deal? 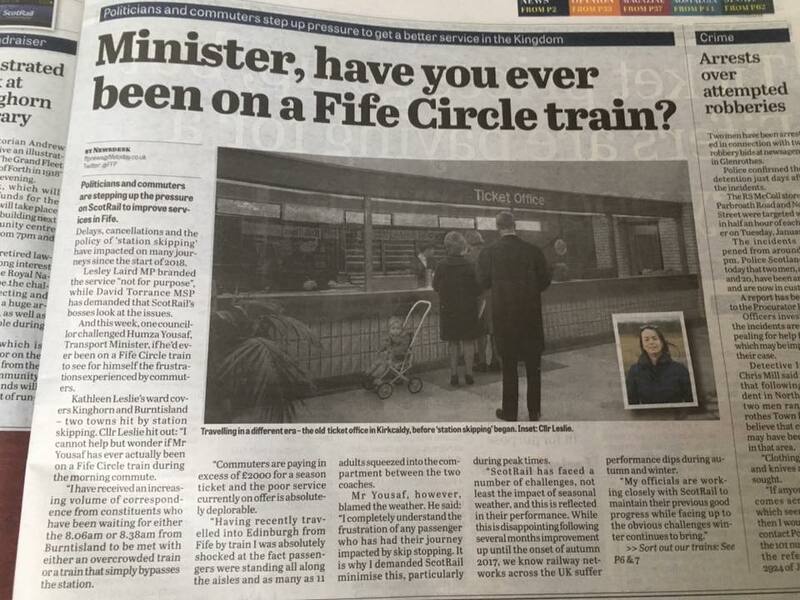 Trains: The Fife Circle - Cancelled/Overcrowded/Skipping Stations - take your pick. 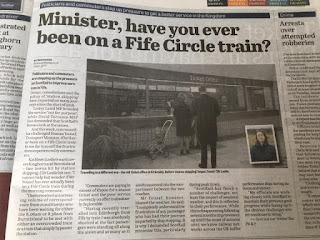 What a shambles Scotrail/Abellio is on the Fife Circle. 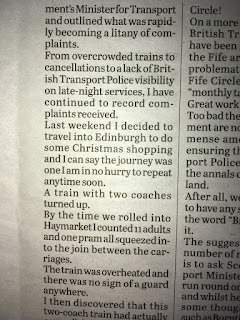 In October a constituent contacted me raising concerns about trains in Fife - from the lack of coaches to a lack of visibility of British Transport Police in the evenings around the upcoming festive period. 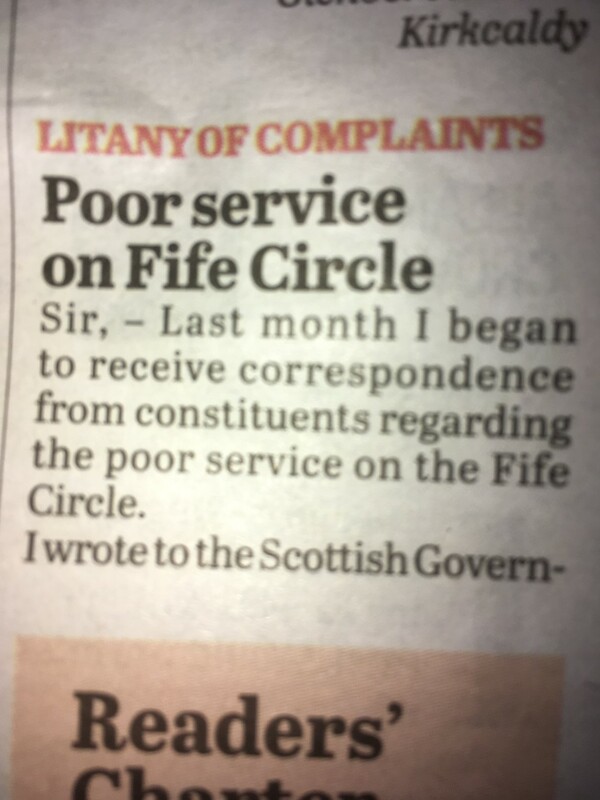 I pushed the issue on social media and since have received an increasing amount of correspondence from, understandably, frustrated commuters. A peak season ticket from Burntisland/Kinghorn/Kirkcaldy to Edinburgh costs around £2000. 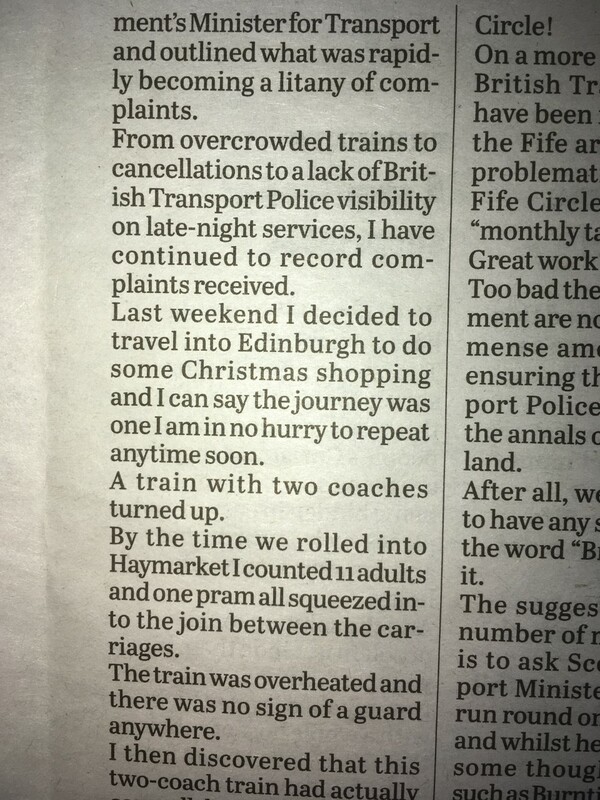 Yet, commuters are traveling on overcrowded and late trains. 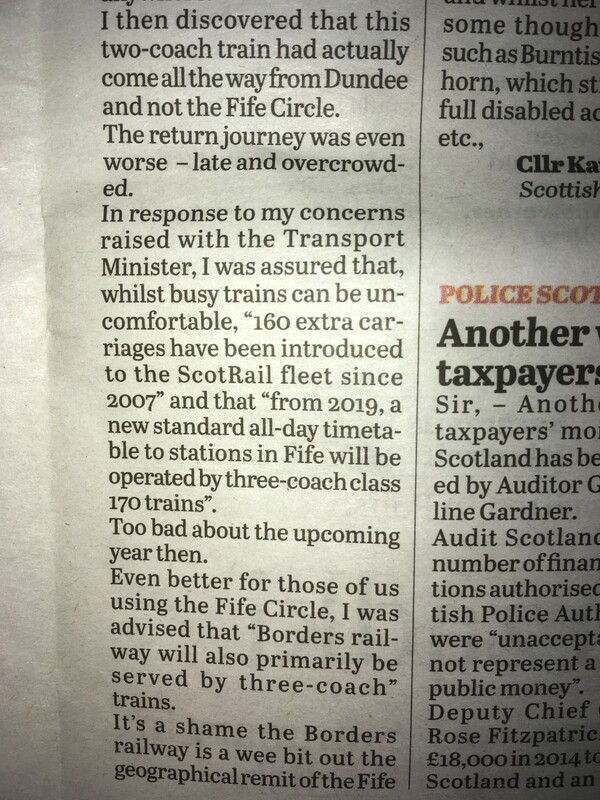 The 08:06 and 08:38 from Burntisland appear to be two of the worst. 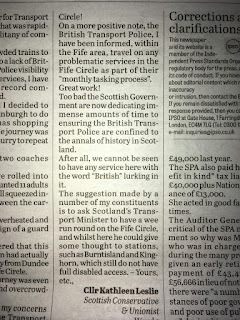 I find the whole situation quite deplorable and when, having written to Scottish Conservative Shadow Transport Minister, Jamie Greene MSP, who very helpfully wrote to the Scottish Government's Transport Minister, I received a letter that appeared to side-step the wider issues and instead received a glowing report on upgrades with the Borders Railway. 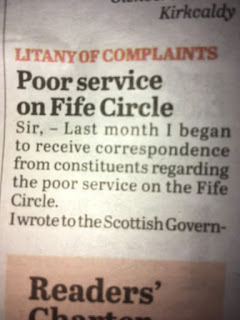 I continue to urge anyone affected by cancellations, delays, lack of seating, trains skipping stations to contact myself or their MSP. 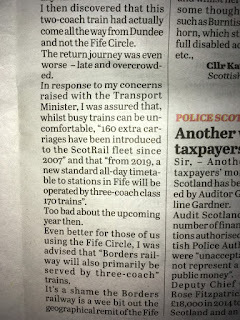 I now intend to write directly to the Transport Minister stating the major concerns and asking for solutions to be sought. 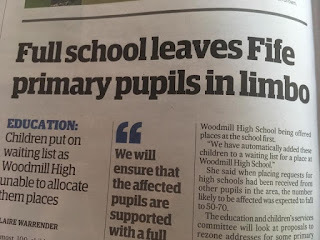 The current situation is quite simply unacceptable.